Tire repair, is it worth it or not to have your tires repaired when you have a flat? In most cases the answer is yes. However there are some situations where you really have no choice about repairing or not repairing your tire. In these situations, you pretty much have to purchase a new tire. Instead of repairing the tire. You might have to replace all four tires, not just the one that was flat. Any time a tire has a sidewall problem, all tire repair garages are going to tell you not to risk trying to repair the tire. In fact they will not repair the tire for you. Since they cannot repair the tire and provide any kind of warranty for their work. They are doing this for your own safety as well as their protection. Consumers in this situation will pretty much be faced with buying a new tire to replace the one that was damaged. The tire has lost the strength it had in the side walls. It could blow out very easily even at low speeds as well as at high speeds which could be catastrophic. Tire sidewall problems occur from being hit from the side. This can be cause by many situations. But usually it is due to hitting the curb too hard and damaging the rim and or the tire itself. If the rim is damaged, you may have to replace the rim as well. A tire side wall can also be damaged by driving too far on a flat tire. Even a few hundred feet can ruin the tire beyond repair. So take care about how far you travel on a flat tire. There are lots of other situations that can cause tire side walls to give out. But if it happens to you, you can be sure that the tire will need to be replaced. A friend of ours had a flat on the highway. By the time he was able to slow down, change lanes safely and get to the side of the highway his tire was ruined. He had driven to far on a flat tire. If your tires are well used and you get a flat tire, it may be time to buy new tires for all four wheels instead of trying to repair the tire. If the tire is bald, the tire repair store is not going to repair the tire for you since they cannot warranty the tire for you. This will trigger a new tire purchase as well. 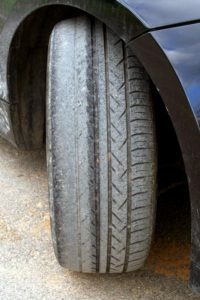 If all of the tires are bald, or nearing the end of their life, you may want to replace all four tires rather than just purchase the single tire. All tires should be roughly the same in terms of mileage and they should all be of the same kind and make to ensure maximum efficiency as well as stability when driving at highway speeds. Do not replace the flat tire with a different kind of tire since it is important to have all four tires exactly the same to provide maximum balance and comfort when you are driving. Sometimes you can make a deal with the tire store when you are purchasing four tires from a dealer. Don’t hesitate to negotiate the best deal you can.